Apple released its latest smartphone, the iPhone SE, in March, months after releasing the iPhone 6S. The 6S marked the debut of some new features, such as 3D Touch and “live photos.” While iPhone SE is also equipped all the features which iPhone 6s has. To many people’s disappointment, iPhone SE doesn’t supply the 32 GB option like iPhone 5s, it still starts with 16 GB capacity. Many people complain that their iPhone SE memory is not enough to use, so they cannot experience all features of this little stuff with ease. It's a bit of a hassle, when you get a new phone with 16 GB. Here are four key things to do to keep your storage down and clean out your iPhone SE memory. Many people like me is a strict fan of electronic games. We like installing and experiencing many kinds of mobile games. So my iPhone SE gets full easily. However, I’m trying to remove some apps these days. Why? You'll want to have lots of games on your phone for those times you're stuck somewhere with nothing to do and, quite possibly, with no internet connection. So make sure you pick games that you'll want to play. I love Sky Gamblers, but now that I've deleted it, it's of no use to me. Even I can play over and over to try for a better score, but I have to clean out memory for my iPhone SE. Since iPhone SE is equipped with an impressive camera, a lot of users like taking photos with it, and the storage and memory gets less and less. To economize your memory space, you can delete photos especially live photos that take up over 8 GB on your device. If you really want to save this photos, you can back up them ahead of time so that you can easily download these photos again anytime you want from iCloud or iTunes. It is very convenient. It's obvious enough that you should delete old apps you aren't using. Because some of them take up a lot of space. The less obvious thing to consider is that a lot of apps will store files offline without telling you. They include Safari caches and history, app caches and cookies, documents and data, temporary files, reading list and etc.. For example, music apps, which will temporarily download songs to give you a better experience. On occasion, those files don't get deleted for one reason or another, so you should check to make sure that isn't happening. 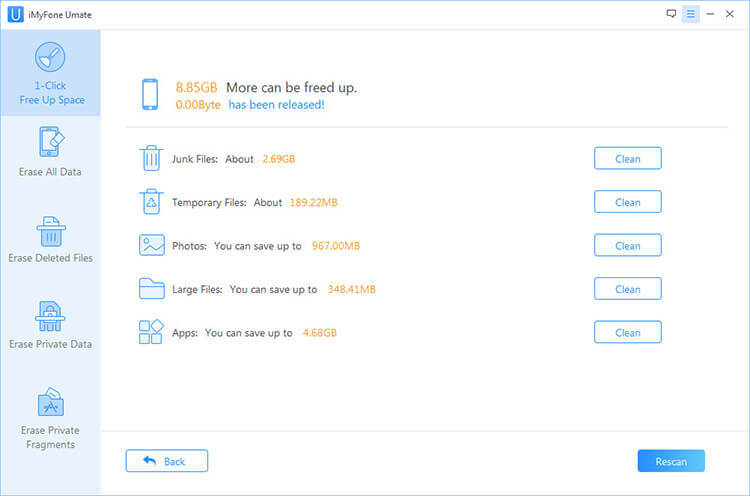 iMyFone Umate Pro or iMyFone Umate Pro for Mac is a powerful, intuitive, comprehensive tool to free up tons of storage space for your iPhone/iPad/iPod Touch! The powerful space releasing functions involve cleanup of all the unwanted junk files and eradication of temporary files, photos compression and backup, large files deletion and app management. Especially, there’s an amazing function of compressing pictures in order to save space. The process of photo compression won’t affect the picture quality at all, saving up to 75% camera photo space on your iPhone. If there are tons of photos that you don’t wish to keep, you can delete them permanently through iMyFone Umate Pro with one click. Original photos will be backed up automatically before deletion and compression. Clean huge storage space with one click, like cleaning junk & temp files, managing photos, removing large files, deleting apps, etc..
All iOS files are supported to manage, like deletion or permanent erasure. 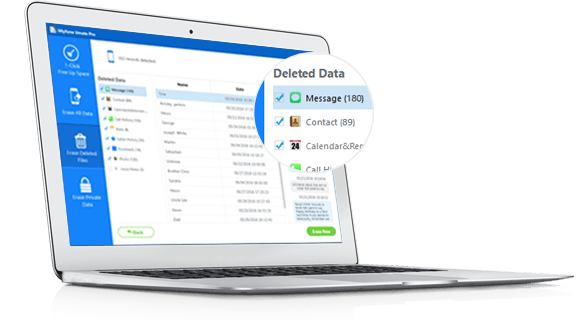 Scan out private data and efface permanently, such as Wechat, Whatsapp, call history, contact, photos, messages, etc. Find out and completely wipe the previously deleted files. The steps are easy to follow without hard learning. You can master it quickly. Setp 1. Connect your iPhone to computer where iMyFone Uamte Pro locates. Setp 2. Click "Quick Scan" tab to analyze how much space can be reclaimed. Step 3. Hit "Clean" button beside each speciafic function to clear junk files, clean temporary files, compress photos losslessly, delete large files and manage your apps. Clean as many as 30+ types of junk files securely. Thoroughly clear up temporary files which is hard to do so without unstalling apps. Compress photos to get back 75%+ of storage space. Back up and delete large files with ease. How to Clean up iPad Storage? Learn the Best Way! How to Empty Storage on iPhone? Fix “iPhone Photo Storage Full but No Photos” Easily Now!